The purpose of this page is to document events recognizing Cadet Nurses and remembering the legacy of the U.S. Cadet Nurse Corps and recognize the hard work of those who worked at making them happen. If you are or will be spearheading a recognition effort in your neck of the woods, kindly send an email to elsie@cox.net with the details: what, when, where, a brief description, your name and email address, and any documents that might be helpful to others in understanding your event and perhaps also to give others ideas about the kinds of things they can do. Some may be seeking formal recognition from the federal government, but all of these local recognition events are equally important. Seventy-fifth Anniversary celebrations are not limited to 2018. Since the program itself lasted five years, it makes sense to encourage celebrating over a five-year span. Some upcoming events are already planned for 2019. Approximately 30 participants engaged in lively discussion about the course of the U.S. Cadet Nurse Corps in Arizona's 5 participating schools of nursing. Participants listened to the Cadet Nurse March, watched Reward Unlimited, the Corps' recruitment video, and reflected on what it must have been like to have been a young woman at this point in history. At the conclusion of the event, participants enjoyed dessert: a Cadet Nurse Corps sheet cake. Museum of the West, Scottsdale, Arizona Women's History Month presentation. Approximately 30 participants, including 3 Cadet Nurses, engaged in lively discussion about the course of the U.S. Cadet Nurse Corps in Arizona's 5 participating schools of nursing. Participants listened to the Cadet Nurse March, watched Reward Unlimited, the Corps' recruitment video, and reflected on what it must have been like to have been a young woman at this point in history. This Road Scholars presentation outlined the history of nurse education in Arizona from the early 1900s through World War II and beyond in Arizona. Approximately 15 participants engaged in lively discussion about Cadet Nurses and the role the U.S. Cadet Nurse Corps program played in making this educational opportunity accessible to many young women who might not have pursued this pathway without this financial support. This presentation took place at the annual conference of the American Association for the History of Nursing, which took place in San Diego, California. Elsie Szecsy and Irene Auteri Ferguson discussed the nature of the program and Adelphi University's participation in it during World War II. The presentation visuals included historic photos as well as Cadet Nurse uniforms and a replica U.S. Cadet Nurse Corps flag. Participants engaged in the discussion about the legacy of the program as well as ongoing and prospective efforts to formally recognize Cadet Nurse service. Mayor Thomas Hayes of Arlington Heights, Illinois, proclaimed July 1, 2018, U.S. Cadet Nurse Corps Day in Arlington Heights. 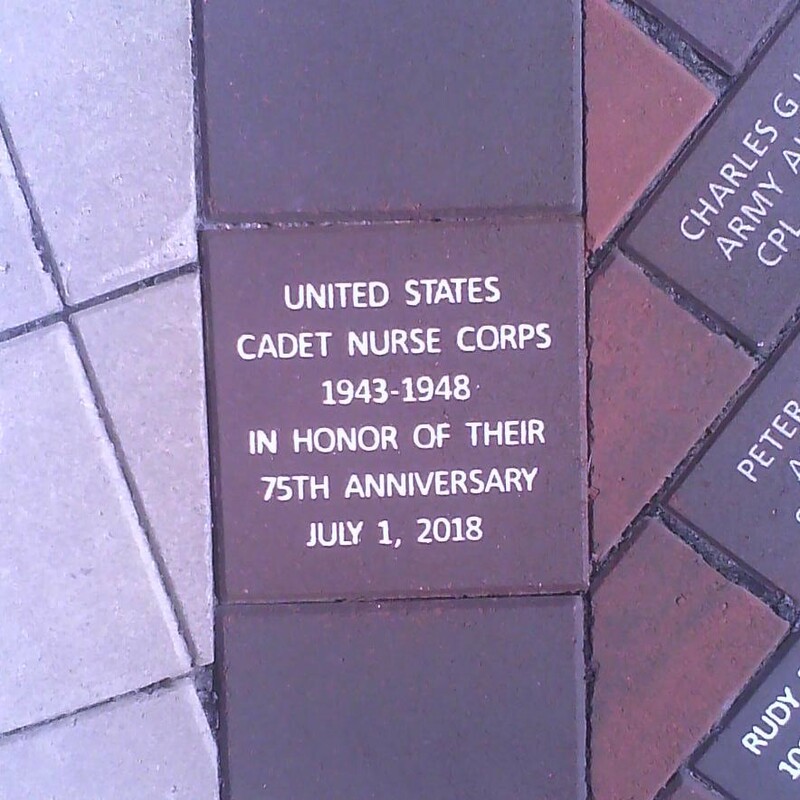 The Arlington Heights Park Foundation also honored the US Cadet Nurse Corps by installing a commemorative brick that has been placed in the main plaza of the veteran’s memorial in Memorial Park in Arlington Heights, Illinois. The brick was installed prior to Memorial Day 2018. The brick is prominently displayed in Section E at the west entrance to the veteran’s memorial adjacent to the eternal flame that is located in the center of the plaza. Five Cadet Nurses were honored at a panel discussion in which they participated at Adelphi University, where many of them were Cadet Nurses at the then only collegiate school of nursing on Long Island. One of them went on to become a member of the nursing faculty, and she convened a session with Chinese nurses who were international students at Adelphi for their training. Following the panel discussion, the honorees and their families joined the Dean, faculty, and other participants for a luncheon hosted by the Dean. Though technically not a 75th anniversary event, were it not for the plaque dedication ceremony at Eisenhower Park in the fall of 2017, there may not have been an event at Adelphi University in May 2018. Tom Moffatt worked with Organization of Veterans Associations leaders and volunteers at Eisenhower Park's Memorial Plaza for the installation of a plaque recognizing Cadet Nurse service on behalf of all of their children. Following the ceremony there was a reception at a local restaurant where all the participants got to know each other better.